The Forest Service is expected this week to formally launch a monthslong process to eventually amend federal greater sage grouse conservation plans covering more than a dozen national forests and grasslands in six Western states. The Forest Service, as early as tomorrow, is expected to publish a notice of intent in the Federal Register announcing it will develop an environmental impact statement (EIS) exploring possible amendments to land-use plans that were amended by the Obama administration in 2015 to include sage grouse protection measures. The notice is expected to include a list of potential alterations to be evaluated, including changes to mitigation strategies and habitat protection boundaries, as well as possibly removing so-called sagebrush focal areas (SFAs) that the Fish and Wildlife Service said in 2015 are critical to the grouse's survival. The changes are similar to those proposed by the Bureau of Land Management last month when it released six draft environmental impact statements covering millions of acres of federal lands across the West (E&E News PM, May 2). The Forest Service is expected to issue a draft EIS by late August, kicking off a 90-day public review and comment period running through late November, sources said. The press office for the Forest Service, which is working with BLM on sage grouse revisions, referred questions to the Interior Department. Representatives with Interior did not respond to a request for comment on this story by publication time. But Sandra Underhill, the Forest Service's Wyoming state liaison, told members of the Wyoming Sage Grouse Implementation Team at a public meeting last week in Lander, Wyo., that the notice of intent is scheduled to be released this week. While BLM plans to finalize its amendments to the Obama-era plans by year's end, it could take the Forest Service until June 2019 to complete its revisions, Underhill told the team, according to a video recording of the meeting. The federal blueprint, in total, amended 98 BLM and Forest Service land-use plans to incorporate grouse protection measures covering nearly 70 million acres in 10 Western states. The plans were strong enough to convince Fish and Wildlife not to list the bird for protection under the Endangered Species Act. 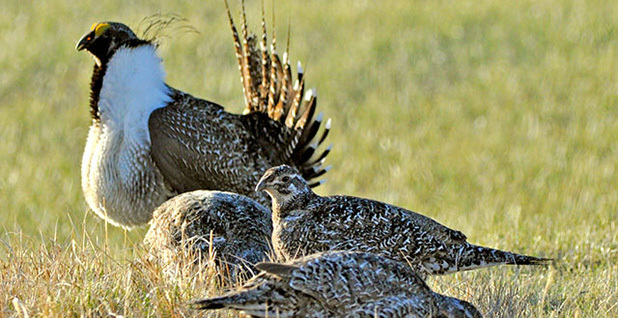 The federal plans cover sage grouse management on national forests and grasslands in Colorado, Idaho, Montana, Nevada, Utah and Wyoming. The decisions by the Forest Service and BLM to revise the sage grouse plans followed a report last year recommending changes to the plans from a team of mostly federal regulators who were directed by Interior Secretary Ryan Zinke to review them (Greenwire, Aug. 7, 2017). Specifically, it recommended exploring amending resource management plans "to remove or modify sagebrush focal area designations." The Forest Service, like BLM, has said that part of its reasoning for reopening the grouse conservation plans is a federal court ruling last year that determined the Obama administration did not give Nevada residents time to review and comment on the proposal to withdraw about 2.8 million acres of SFAs from new mining claims in the state (Greenwire, April 4, 2017). U.S. District Judge Miranda Du's order directed BLM and the Forest Service to supplement their yearslong analysis of the grouse plans to include information and opportunities for public comment on the plan's proposal to withdraw the SFAs from mining. But some conservation leaders questioned the need for the Forest Service to look at amending the plans, which took years to develop with states and numerous other stakeholders. "I've known this was coming," said Brian Rutledge, director of National Audubon Society's Sagebrush Ecosystem Initiative. Rutledge, a member of the Wyoming Sage Grouse Implementation Team who attended last week's meeting, said he's worried that the Forest Service will simply follow BLM's lead and propose substantial changes to the federal plans. "What I am concerned about was the suggestion that the Forest Service is just going to do what BLM tells them," he said.